Rome is one of the least affordable cities in the world and it has become quite the predicament for those looking to live in Rome on a budget. As major cities are becoming less affordable, they are also becoming more lonely, with individuals feeling more isolated and separated from each other than ever. The concept of collective living has existed for hundreds of years, and is only just beginning to re-emerge in western societies. Communities are created through intentional architecture which creates shared spaces in which residents interact in numerous different ways, from sharing meals and socializing to sharing the burden of child care. 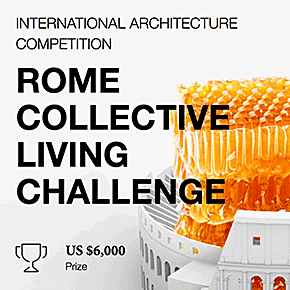 For the Rome Collective Living Challenge, participants are tasked with designing a concept for affordable housing in Rome that fits the ideals of a co-living lifestyle. Rather than rolling out hundreds of new tiny apartments in Rome’s city centre, collective living could offer something more than just an affordable place to live; a community to live in within the hustle and bustle of Italy’s capital. Designs should be minimal in their requirements of land and materials so that they could potentially be rolled out across the city to increase housing stock capacity. A key factor that participants must keep in mind for the Rome Collective Living Challenge is that this is not a simple housing solution - rather it is a new concept in community living, and would need to be developed following the co-living principles.